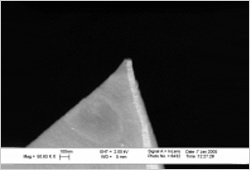 By simply buying larger package sizes of SmartTip AFM probes, you automatically get a built-in quantity discount compared to the smallest packaging size. A package of 10 pcs. costs 995 USD. The SC-20-M is SmartTips® improved resolution side coated MFM probe. Compared to the standard SC-35-M probe it trades signal strength for improved resolution. It is therefore most suitable for high resolution measurements on hard magnetic samples. By the use of Side Coating technology the sharpness of the probe is maintained to combine good topographic resolution with high magnetic resolution and stability.